Friday February 1, 2019-Former Gatanga MP, David Murathe, has accused Deputy President William Ruto of being behind the Kikuyu rebellion against President Uhuru Kenyatta and his family. For the last two months, Kikuyu leaders led by Gatundu South MP, Moses Kuria and Bahati MP, Kimani Ngunjiri, have been speaking ill against President Uhuru Kenyatta‘s family. The two MPs accused Uhuru of marginalizing Mt Kenya region despite the region being his political bedrock. Now according to Murathe it is Ruto who is incited those MPs against Kenyatta’s leadership. “The most fatal mistake DP Ruto ventured into was an attempt to incite the kikuyu community against the Kenyatta family – very very dangerous and unforgivable sin in Kenya politics. The Kenyatta’s are aware that Ruto successfully incited that kalenjin community against the Moi family, relegating the retired President to near political oblivion and rendering him irrelevant in Rift Valley politics. 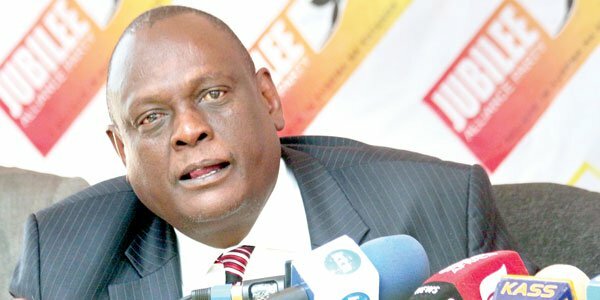 There is no way Uhuru will sit pretty and watch Ruto doing the same to the Kenyatta family,” Murathe told a local daily on Wednesday. Murathe said he will launch a party soon that its aim will be to reduce the DP to nothing. “He will be crushed without mercy and reduced to a spineless quisling pawn,” Murathe stated. crush your filthy balls, then tell your zombies how it feel. useless bigots!